A journey through the beautiful Bukovina in search of dialect words. Do you think that learning experience is just a training practice, and transcription of dialect texts is boring and troublesome thing? Ask what the second year students of specialty “Ukrainian Language and Literature” of Faculty of Ukrainian Philology and Social Communication think about it. 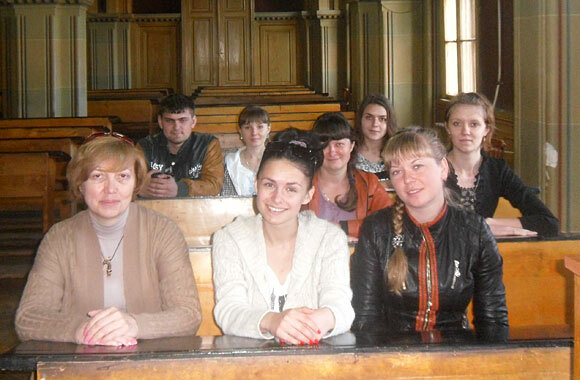 On May 21, they returned from Chernivtsi, where the dialectological practice took place. Entering the gates of Chernivtsi National University we were in a fairy tale, because the architectural ensemble of the residence of Metropolitan of Bukovina and Dalmatia (now Chernivtsi National University) contributed the most prestigious world heritage list – UNESCO World Heritage Site, resembles a medieval castle. The Marble and Blue Halls of the University, the Church of Three Saints … And among all this beauty, which attracts and fascinates, were lecture halls, which affect academicism. The tale continued the next day when we arrived in Khotyn and Kamenetz-Podolsk fortress – medieval monuments on the steep banks of the Dniester and Smotricha. A trip to the Hutsul village Putili was also unforgettable, because here was born Yuri Fedkovich. Now his memorial museum is located here. Carpathians, washed by the May rain, laid the velvet grass under our feet. The surrounding beauty was simply breathtaking. Later we visited museums, historic sites, met many interesting people, who were open, sincere and hospitable! Thanks to these people our trip became possible. The rectorate of the University, the administration, teachers, graduate students and students of the philological faculty, librarians, employees of theater and museums, businessmen were united by one wonderful person – Lyudmyla Oleksandrivna Tkach. She initiated this trip, developed its program and put it into practice, for which we are very grateful to her. New experiences, new knowledge … We have learned how to pass through the masonry mountain river and learned how to spread the furnace, tried the local traditional dishes, even tried to play on trembita. In addition, we visited the museum of the world famous embroidery Ksenia Kolotilo, whose pictures are embroidered with a unique technique “drawing the eye of a needle.” We recorded the original and instructive stories of old people in the village Yarovka of Khotyn district founded in early XVII century. There was a very interesting academic event. 18 May they held a presentation of Luhansk and Chernivtsi dialectological schools, which was attended by the Rector of Chernivtsi University S.V. 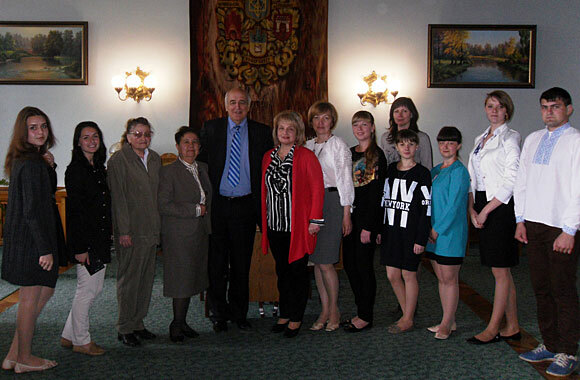 Melnychuk, teachers and students of two universities. The cultural program was very saturated. 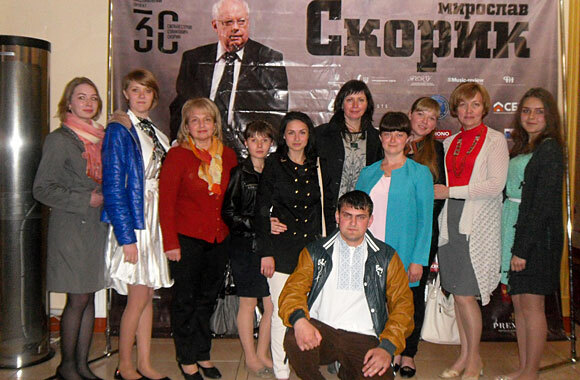 It included a play “Shelmenko-denshik” in the musical-drama theater, a visit to the literary-memorial museum of Olga Kobylianska, Symphony Orchestra concert featuring Skoryk in Chernivtsi Regional Philharmonic. 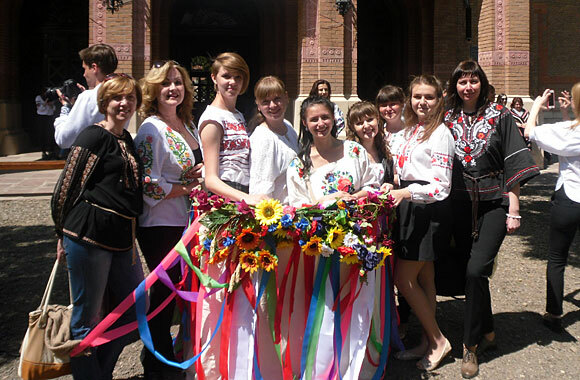 The finale was the participation in the celebration of National Vyshyvanka Day, which was founded 10 years ago in Chernivtsi, and now widespread throughout Ukraine. Do you keep thinking that the educational practice is just a learning experience?